Complete the online application form (includes statement of interest and CV) and pay the fee. Upload transcripts from all past post-secondary study (domestic and international student requirements may differ). Send three letters of reference to the iSchool as part of your application. Include copies of your English proficiency exam scores (if applicable). Include copies of your permanent resident card (if applicable). Identify a research supervisor as part of your application (for PhD’s, MACL). Please visit the Graduate Studies requirements for documentation before sending in official documentation. Applicants should also review the Prospective Student Gateway at UBC’s Faculty of Graduate Studies for an academic profile of UBC, UBC admission requirements for graduate study, and details on the application process. As a general note, meeting the minimum admissions requirements does not guarantee you entry into the program, as our programs are competitive. One scanned copy of a transcript from each post-secondary academic institution attended. Please scan and upload digital copies (.pdfs) of official required documents in the application system. These are considered "unofficial documents." An up-to-date CV or résumé. *Reference request emails are sent to your listed referees at the moment you submit your online application. Please note that if you have provided a free email address (Yahoo, Hotmail, Gmail, etc.) for any referees, they will receive an email providing instructions for submitting a paper reference, as they will not be able to submit online. *References are due by the supporting document deadline. *All reference letters must be submitted in English, or must be accompanied by a word for word translation. Proof of English language proficiency, if applicable (see below). Applicants from a university outside Canada, in which English is not the primary language of instruction, must present evidence of competency to pursue studies in the English language. Accepted tests, taken in the past 24 months, include the TOEFL examination and IELTS. 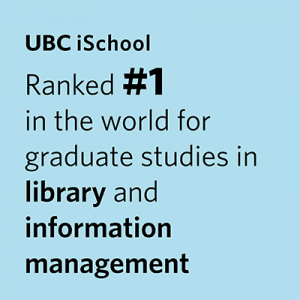 your career goals and how the program at UBC iSchool will help you to achieve them. Applicants check their status in the application portal. Please always check the status of your application first before contacting the office. If you are concerned about supporting documentation arrival times, referee changes etc., please contact us. Notification of Acceptance will not be made via the online application portal. All applicants (successful and unsuccessful) will be notified of their admission status via email six to eight weeks after final deadline for supporting documentation. Please read the instructions carefully. If you have any questions, you can use the contact form below, or contact ischool.program@ubc.ca. Possess a four-year bachelor’s degree or the equivalent from a recognized university in any academic discipline. We welcome degrees with areas of concentration in the sciences, humanities, social sciences and interdisciplinary studies, as well as dual degrees, double majors, and major/minors. Applicants holding undergraduate degrees in the masters degree subject areas (library science, archival science) are examined on a case-by-case basis. The admissions committee reviews degree transcripts closely for evidence of coursework showing significant theoretical and academic content. Have achieved a minimum overall average in the B+ grade range (76% at UBC) in third- and fourth-year level courses of a bachelor’s degree. This is the minimum admission standard; exceeding this requirement will increase the likelihood of being recommended for admission. For students with a degree from a university outside of North America, academic coursework from all years of study is used to calculate academic performance. International students should check admission requirements for their country via the UBC Graduate Studies website. Show promise of superior professional performance as attested by letters of reference and the iSchool application questionnaire. Students interested in the Designing for People specialization should apply to the DFP program separately, after they receive acceptance at the iSchool. For specific admissions requirements, or a timeline of how/when to apply visit the DFP website. Possess a four-year bachelor’s degree (or its equivalent) from a recognized university in a relevant discipline or in an area which is regarded as appropriate by the MACL Admissions Committee. An undergraduate student considering working in the field of children’s literature should consult the School about useful preparatory classes. An interview may be arranged at any time. A broad cultural background is expected of M.A. candidates. The prospective student should select courses to give some acquaintance with the humanities and social sciences during undergraduate studies. Particular attention should be paid in undergraduate or graduate studies to courses in children’s literature, English, writing for children, child psychology, and the history of childhood. This last statement will help the selection committee with respect to understanding which of the four departments working in the Master of Arts in Children’s Literature Program is likely to have a faculty member to supervise your thesis. The thesis statement should be well-researched and cited. The student must meet the overall admission standards established by the UBC Faculty of Graduate Studies. Applicants must possess a graduate degree in library, archival or information studies. Consideration will be given to applicants with a master’s degree or equivalent in another discipline relevant to their field of research. First-class standing is strongly preferred. Applicants with graduate program standing below B+ (upper second class) will not be considered for admission. The applicant’s suitability for advanced graduate work, as evidenced by the application and supporting documentation. A match between faculty expertise and the applicant’s research interests. The availability of a research supervisor among the iSchool faculty. Applicants must identify a potential research supervisor as part of their application, and are encouraged to research faculty members to identify shared interests and the possibility of supervision. A statement of research intent (see below) and a personal statement (maximum 500 words). Together, these two documents should outline the applicant’s research interests, research experience and career objectives. Three confidential reference reports, preferably from persons in academic communities, who are able to assess the applicant’s research ability or potential. The references must contain original signatures and must be received in a sealed and endorsed envelope, or submitted electronically through the E-Ref system, initiated by the applicant in the online application system. Emailed references are not accepted. Applicants whose graduate work was completed three or more years ago may substitute a professional reference for one of the academic references. Applications must include a statement of research intent of no more than 500 words. This statement will be a key factor in the consideration of applications. The statement should describe original research, and articulate how the iSchool is perceived to support this research. It may include a bibliography, in addition to the 500-word research statement. What issue will the research address? What is already known about the issue? How is the approach innovative? How will it advance knowledge in the field? A personal statement of no more than 500 words is also required. It should outline the applicant’s research experience, reasons for choosing UBC, and career objectives, and should describe how the applicant is qualified to carry out the research, and what academic knowledge and experience he or she brings to the research proposal. The Doctoral Studies Admissions Committee reserves the right to request an interview, in person, by telephone, or by video conference, or to request additional references. Prospective students can use this form to ask questions about the school's programs. Applicants can also use this form to ask questions throughout the application process. In what country did you complete your undergraduate education? Your answer to this question will allow us to provide you the most accurate information regarding admissions requirements. Your answer to this question will allow us to provide you the most accurate information regarding tuition rates.